One amateur athlete, two of the world's best trainers and twenty six miles of pain. This blood, sweat and tears journey follows presenter George Lamb, as he transforms from couch potato to long-distance athlete in just 18 short weeks. Having signed up for the 2018 Virgin Money London Marathon, George knows he'll need all the help he can get. Can Sports Personality of The Year 2017 and four-time Olympic champion, Sir Mo Farah, and The Body Coach, Joe Wicks, get George over the finish line? Will their training, advice, guidance and moral support be enough? Join George every step of the way as he faces the greatest challenge of his life. Experience every early morning, painful blister and moment of triumph. Meet sports psychologists, Olympians and Marathon legends along the way. Packed with entertaining insights, immersive reality coverage of his training and essential tips, this series promises to entertain, educate and inspire, whether you're competing on race day, or simply watching from home. 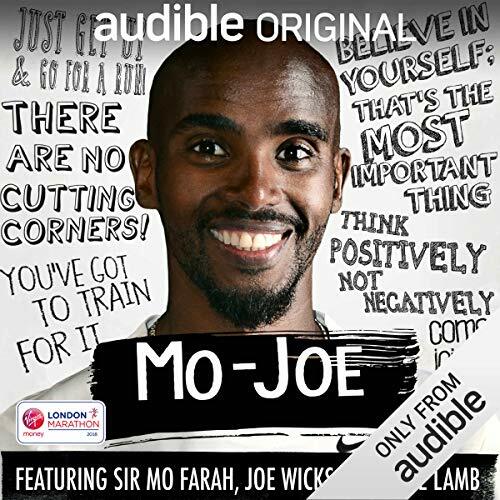 As an Audio Show - free for members - when you add Mo-Joe to your library, you'll get all 18 episodes, each with a runtime of about 25 minutes.